A photo from a previous Cambodia-China bilateral engagement. As I have observed previously in these pages, Cambodia has a long and strong defense relationship with China, with Beijing being the Southeast Asian state’s largest donor of military aid. In providing such aid, China asks few of the questions that some Western countries, including the United States and Australia, have over Cambodia’s worsening rights record. Over the past few years in particular, Cambodia has been expanding ties with China even further in this realm while downgrading military ties with Western states. Cambodia and China have unveiled new exercises and engagements amid scrutiny of some aspects of their relationship, including rumors of a Chinese naval base in Cambodia (See: “What’s in the China-Cambodia Military Base Hype?”). One of these engagements has been Exercise Golden Dragon, which, though originally billed as focused on areas such as natural disaster relief, has gradually expanded to include other areas as well. The last iteration, held in March 2018, featured around 500 soldiers and lasted a little less than two weeks. 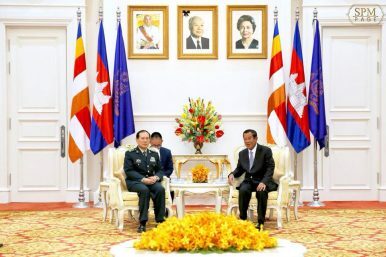 Though small in size and scale, that was nonetheless the largest and longest engagement of its kind between the two sides, according to figures quoted by Cambodian officials. Last week, China-Cambodia defense ties were in the headlines again with the kicking off of the third iteration of the China-Cambodia military exercise. The third Golden Dragon military exercise began on March 13 after weeks of rehearsals by the two sides, featuring a mix of personnel as well as equipment including helicopters, guns, tanks, and other heavy combat equipment and ammunition. Per information disclosed by the Cambodian defense ministry, the exercise, which is expected to last around two weeks, features around 252 Chinese soldiers and 382 Cambodian soldiers along with some 2,200 other personnel, including paramedics. This year’s iteration is focused around issues such as counterterrorism, peacekeeping, and humanitarian assistance and disaster relief and is focused around Chum Kiri Military Shooting Range Training Field in Kampot province’s Chum Kiri district. Royal Cambodian Armed Forces (RCAF) Deputy Commander-in-Chief Ith Sarat told reporters during the opening ceremony last week that this year’s exercise saw the largest number of personnel thus far involved in any Cambodia-China exercise. The significance of the exercise, and its expansion relative to previous iterations, ought to be seen as just another manifestation of Cambodia’s growing relationship with China. While Cambodian officials have been careful to communicate that this ought not to be seen as directed at any other nation, it is yet another indicator of the extent to which Cambodia has tilted toward China, even amid broader adjustments in its domestic and foreign policy, including normalizing ties with the United States. To be sure, the exercise is just one manifestation of the wider China-Cambodia relationship, which, according to Cambodian officials, is set to continue into next year as well. But amid broader questions about Cambodia’s own perceptions of itself and its approach to the world amid wider trends, including rising U.S.-China tensions, Phnom Penh’s approach toward Beijing will continue to be important to watch in 2019 and beyond.